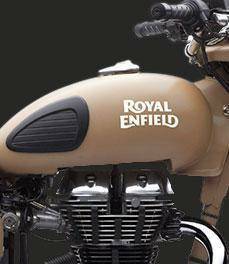 *Actual On Road Price of Royal Enfield Classic Desert Storm at the dealership may vary. The Royal Enfield Classic Desert Storm is based on the Classic 500 but is special because it features a unique sand paint scheme reminiscent of the First and the Second World War era. The Desert Storm is powered by a 499cc, single cylinder, 4-stroke engine producing 27.2bhp. The rest of the styling remains the same as the Classic 500 but the headlamp is a powerful halogen bulb.